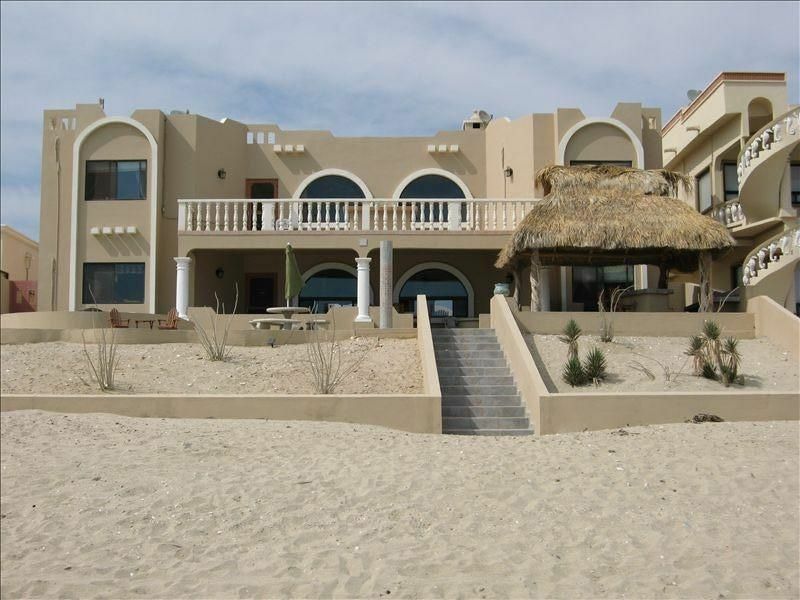 All 4 Bedroom Are Beachside, Two Master Suites Upstairs and Two Master Suites Downstairs. Each Bedroom has its own bathroom & 42' Plasma TV/DVD. We have A fully stocked kitchen! There is a spacious great room. A huge beach side palapa with a custom bar, built in barbecue & 2 fire pits...perfect for entertaining, for weddings or special events. Watch the most amazing sunsets, DOLPHINS & WHALES from the great room, patio or beautiful upstairs beachfront balcony or right on the beach. All 4 bedrooms have plenty of extra bedding and pillows. They are decorated with plush, comfortable bedding and accessories. Satellite and a flatscreen in the great room with hundreds of dvd movies to choose from! With a beach like this, you won't be inside often!! !!! !HOUSE FEATURED ON CHANNEL 5 MORNING SHOW!!!!! We are a family of 5 and enjoy spending lots of time at our beach home in Mexico. I have enjoyed Rocky Point since I was 15. My husband & I also sent much time there staying in town before we began a family. When we started a family, we decided to purchase our home on the most beautiful, safest beach in Puerto Penacso 'Rocky Point', (Playa Encanto-Voted Best Beach) We have 3 daughters have three daughters and enjoy many family memories going to Rocky Point. Since our girls have gone to school full time, we decided to share our beatiful house when we are not using it. It is not like any other rental. It is warm & inviting. We regularly maintain & update our home. All the amenities my family enjoys we share with our guests, so I am very selective who I rent our beach house to. When you stay at my house, it is truly like staying at a friends house. We wanted a beach house in Mexico. Rocky Point is beautiful & very safe. It is a convenient drive from Arizona. From the Phoenix area, it is 4 hours (door-to-door) Crossing the border is hassle free. Much to our delight, it also has the best beaches we have ever been to! They are not crowded. I can't think of any beach vacation that is as wonderful. It is the best beach in Rocky Point! There are tons of shells, sand dollars, starfish and sea life. Dolphins swim by daily. It is very peaceful and beautiful. I jog 6 miles or practice yoga on the beach. It is safe, clean and very peaceful. VIDANTA GOLF COURSE AT THE MAYAN PALACE, OCEAN FRONT, JACK NICHOLAS DESIGNED. STAY WITH US & GET SPECIAL DISCOUNTED ROUND RATES. ALL INCLUDED: LATE CHECK OUT, EARLY ARRIVAL, CLEANING, PETS WELCOME AT NO EXTRA CHARGES! Nice, big house on the beach. Hassle-free check in/out. House had four master bedrooms all facing the ocean, as advertised. Also had an additional “wing” with four kids’ beds, another separate room with a queen bed and 2 additional bathrooms. There were 6 total bathrooms in the house! It was cold when we were there, so we never used the AC, but the house had units in all the rooms. The beach at the house has no rocks anywhere in sight- great for enjoying the giant sandbars when the tide goes out. An overall great property. Wonderful, accommodating house right on the water. Really enjoyed sitting out on the deck, listening to the waves and reading, grilling or just simply relaxing. Well kept home with plenty of room for all of us. Owner was very responsive to any questions we had before our stay and really had a pleasant relaxing time. Great walks on the beach and really appreciated being able to bring our dogs who absolutely loved the beach and walks as well. Would recommend to anyone. Thank you! Mark B. Wonderful Christmas vacation on the beach in a beautiful home! Our family had an amazing Christmas on the beach of playa Encanto. We had church on Christmas morning outside in the back with the beach as our view. This house had everything we needed to enjoy our stay. The most important thing was that my family felt very safe. Having a beach home as beautiful as we did with all the things that was needed to enjoy the beach was all amazing and the best experience ever. We had no problems with checking in or out. The owners allowed us to check in two hour early and that was nice of then. Ericka and Bruce thank you for allowing my family to enjoy your home during our Christmas vacation. Thank you for allowing us to add to more people to our party. We cant wait to have another experience in your home. The house was perfect. 4 Master bed rooms facing the beach. The location of the house is far enough away from town, yet not too far from town that we did not have to deal with the weekend warriors. Great home for a family vacation. Owners were very accommodating and easy to reach for any questions. Thank you! We look forward to your next stay with us! Safe travels. Amazing Home with beautiful beach and views. We enjoyed the beach and relaxing in the home. The 4 bedrooms were large with ocean views and the kitchen was packed with the essentials. We loved eating on the patio and taking walks on the beach. The house was perfect for our large family! Thank you for your reciew. Hope to see you back again. The property is excellent as is right on beach and they beach is very sandy with no rocks. I very much recommend the house, location and the property management was excellent with very quick response on service or questions. PLAYA ENCANTO beach is one of the best beaches in the area. The beach & water are perfect for swimming, sunbathing or exploring. It has over three miles of beautiful sandy beach with amazing tide variations for exploring all the sealife, shells, sand dollars, starfish & marine life. There is also a very fun & educational Marine Biology Aquarium 'Cet-Mar' & Whale Exhibit 'Cedo Museum' to visit located towards town about 10 minute drive. NO EXTRA FEES FOR EARLY CHECK IN & LATE OUT - NO CHARGE!! !